Donated to HART by one of our generous supporters, a beautiful 2,556 sq. ft. residential home site, located in Phase 1 of Gallatin Woods, could be yours! Special thanks to Robert Custer of Custer Realty & Auctions and Thomas R Janes of Deep Creek Title, for donating their services! 2,556 square foot residential home site within a condominium community of single family homes. 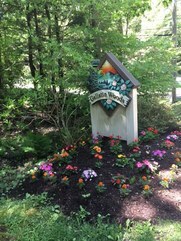 Gallatin Woods is a unique log home community located on Lakeshore Drive in the innermost part of Deep Creek Lake. Property may be viewed at any time prior to the auction. As a condominium community, purchaser will own an interest in the entire community and will be a member of the Gallatin Woods Council of Unit Owners. Each owner may build within the building cylinder indicated on the plat and have exclusive use of the parking area and the additional land that immediately surrounds the home site. Owners may choose their own builder, but all builders must be approved by the Architectural Review Committee. Owners may choose from any of the log home plans offered by Gallatin Woods. Exterior color is a specifically designed natural wood tone. All roofing is green metal and windows have matching green cladding. All other building elements adhere to the architectural standards recorded in the condominium documents. Owner is responsible for all transfer taxes, taxes, HOA fees (approximately $60/month) and water/sewer fees ($82 quarterly). High bidder will sign a contract and must make a non-refundable deposit of 10% of the total purchase price ($5,000 minimum) immediately following auction - cash, cashier’s checks, personal checks and business checks (electronically processed) are accepted - the balance of the purchase price and all closing costs are due at closing within 30 days.